Feurio! 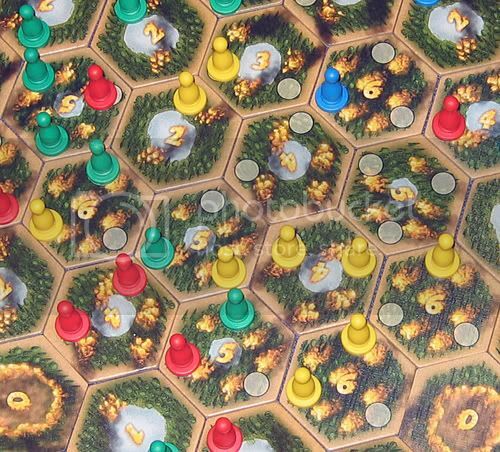 (yes, with the exclamation mark) is a board game from Germany in which players fight a forest fire by placing firemen, and compete to try to block each other's paths. More interestingly for this site, it also has a cooperative mode. A Feurio! game in progress. Feurio! is essentially a connection game, where each player must keep a connective path with their firemen, and that path must include at least one tile that has a free edge. Players can make more than one such path and, as long as they are connected to a tile with a free edge, they all count. The stronger the fire (as represented by the number on the tile), the more points that tile is worth. The first tiles are laid down at the first player's discretion, and tiles are from then on added to the area where the fire is strongest. If Feurio! is a connection game, then cooperative Feurio! is a cooperative connection game. The goal here is to ensure that all players have one, and only one, valid connective path after all firemen have been played. Because of the unpredictability of new tiles, players must deal with an ever-changing landscape, although areas of lower and higher fire intensity are easily discernable. I have seen no reports of people playing this game in cooperative mode, but the concept is novel.